In this online class we share the skills and knowledge on how to prevent, recognize and treat issues with companion animals. We do this in a convenient and interactive way. Pet Health Academy was developed to be the most comprehensive and real life way to building the confidence for people to make pets lives better. Be prepared to save an animal’s life for just $65. Groups of 5 or more, receive 10% off when buying courses in bulk. If at any point before completing the course you are not satisfied we will refund your account. It is our goal to provide you with the training to prevent issues, recognize concerns and treat accordingly. This course can be taken from any mobile device from any location that has access to the Internet. Take it at your own pace and return easily to where you left off. There are no geographical restrictions! Buying for your staff or a group? Just purchase the quantity of courses you need and we'll send you access codes. 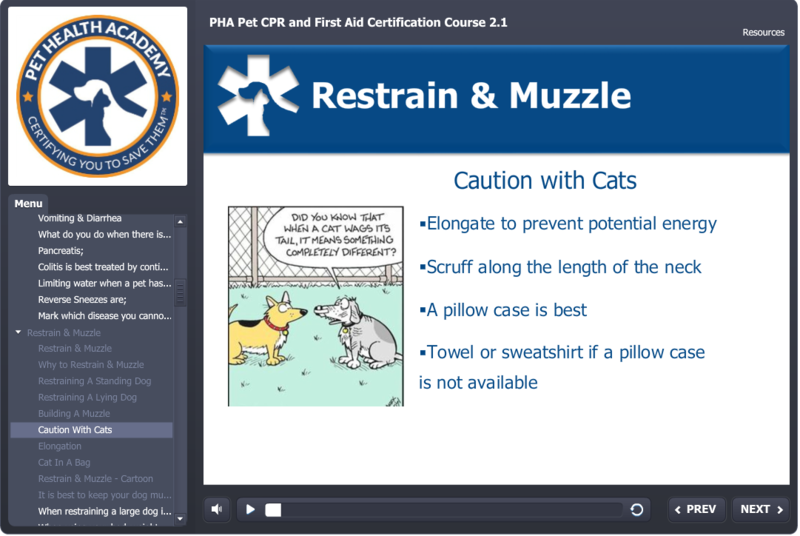 In this section of the course, you'll learn the common issues to expect in both cats and dogs. The list includes issues such as vomiting & diarrhea, parasites, lick granulomas, lipomas, mange, pancreatitis and more. Knowing the ailments before they become a problem is the best way to deal with them. 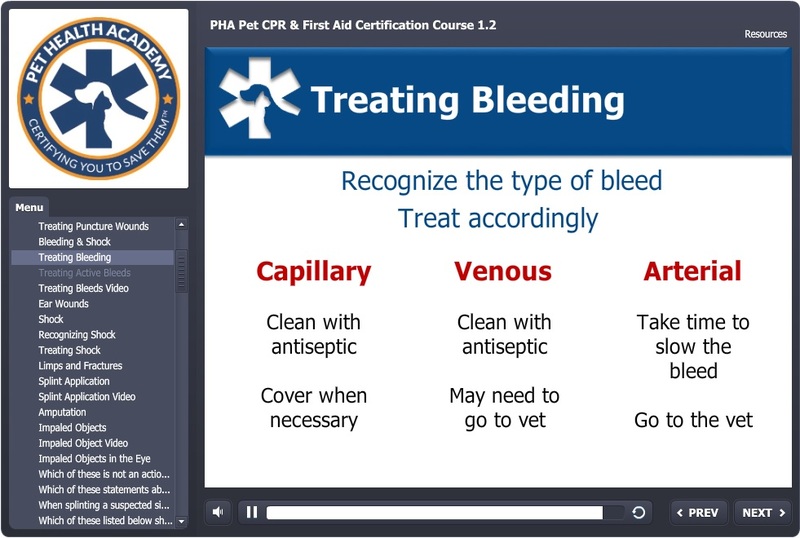 The example slide gives treatment information for minor GI upset, which is especially common in dogs. In the "Vitals" section of the course, you'll learn to safely take the temperature, breathing rate, heart rate, capillary refill time, etc. of pets. We encourage students to try these techniques out on their pets for their own practice and for the sake of their own pets. Animals who are familiar with these techniques are more relaxed when an emergency occurs and you need to check their vitals. Also, knowing what is normal for a pet will help you determine when something is wrong. Always document the normal vitals of your animals. Restraining and muzzling are important techniques to keep the rescuer and animal protected. An injured pet, even one you're familiar with, can react defensively. It's important for the rescuer to stay safe by knowing the technques to restrain and muzzle all different sizes and body structures of cats and dogs. Muzzling techniques can also help calm animals during emergencies. Pet first aid covers a wide variety of issues, from broken toenails to impaled objects. Appropriately assessing an injury (and doing so quickly) is a large part of effectively helping a pet. Puncture wounds, for instance, can be difficult to locate because the entry wound is small and they're often hidden by fur. If left untreated, they can cause major infection. During this course, you'll learn to deal with them the right way. A choking animal is only minutes away from a deadly situation. There is no time to search the internet for the best technique and the heimlich is only for humans. 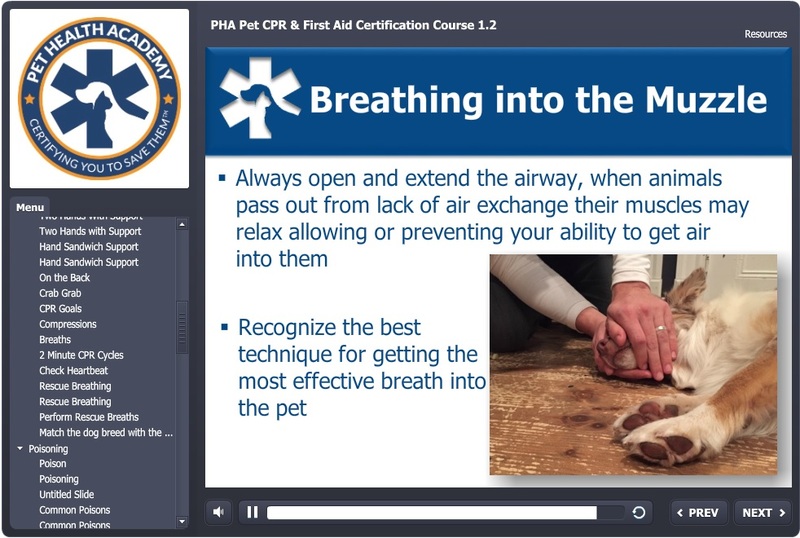 In this section of the course, you will learn how to recognize and treat conscious and unconscious choking pets. Dogs are more likely than cats to choke because they taste the world with their mouths, but all pets can choke. Will you be ready? 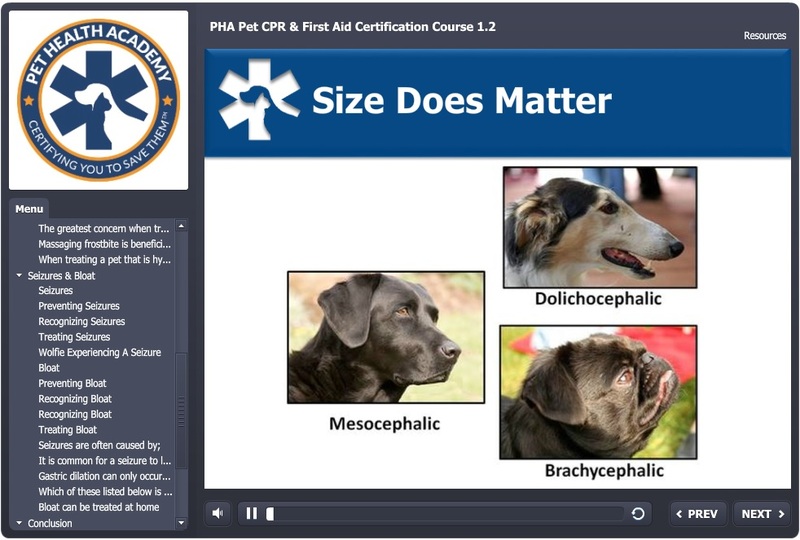 Pet CPR is more complicated than human CPR due to the huge variation in body size and structure between different breeds of cats and dogs. 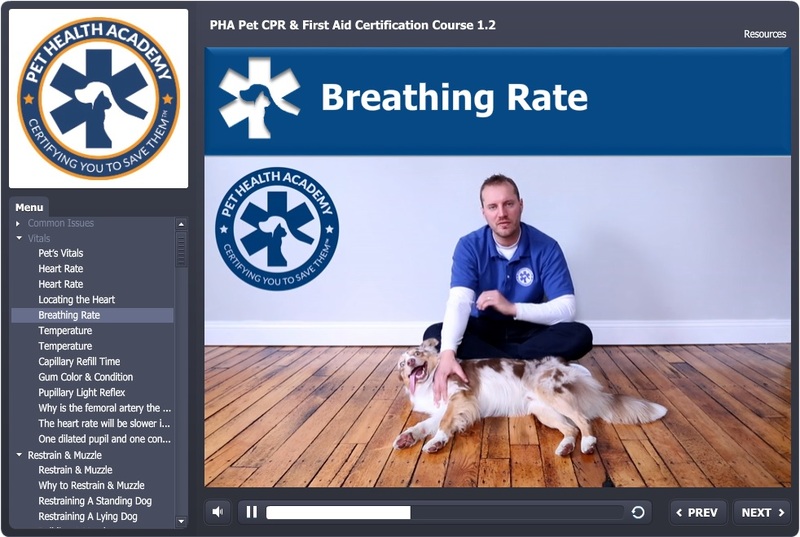 In this section of the course, you will learn to quickly identify the best technique for delivering effective compressions and breaths. 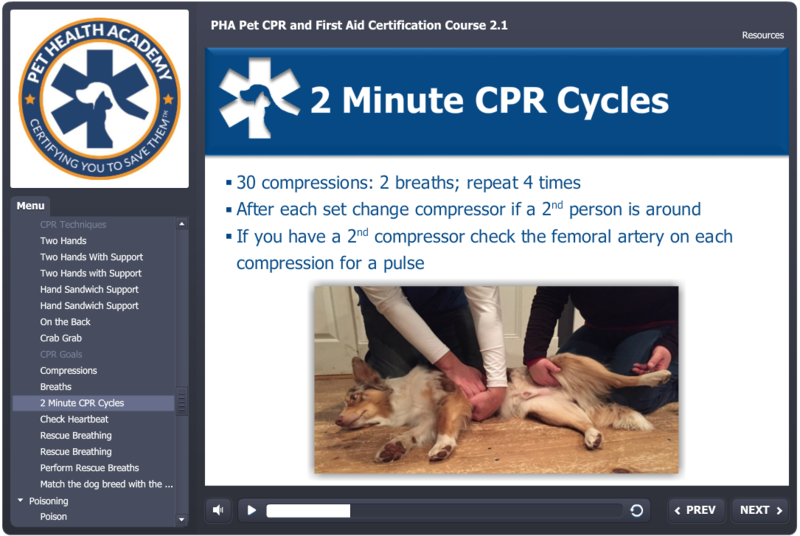 Gain the confidence to save a pet's life during this course by practicing with your own pet! Did you know that cats and dogs often ingest poison after walking through a hazardous substance and then licking their paws? This makes identifying the substance very difficult. The first part of protecting your pet is to prevent access to hazardous substances. 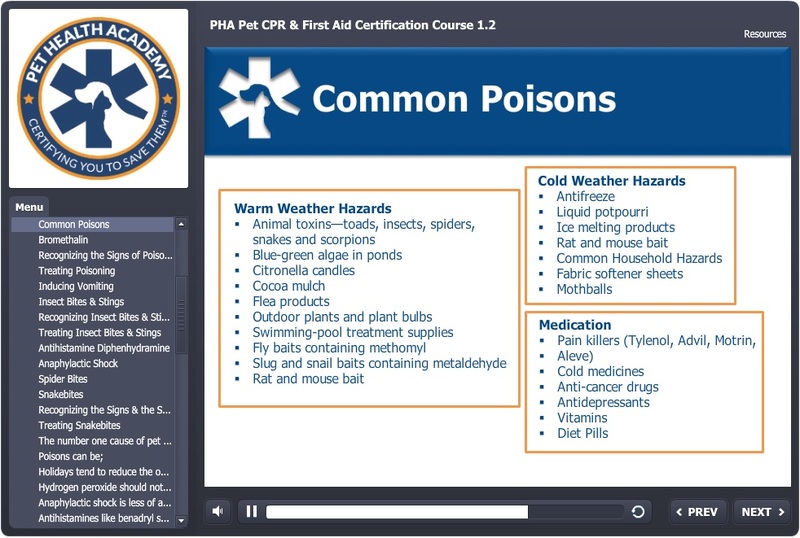 In this section, you'll learn many of the common poisons and then how to recognze a poisoned pet, plus how to deal with it. Dogs and cats are susceptible to hypo- and hyperthermia just like humans. As you can see from the slide, a dog's muzzle structure affects how they dissipate heat. It's important to understand the differences in each animal and how the heat/cold affect them. If you discover a hypo- or hyperthermic dog, we'll teach you how to deal with it. Meet our friend, Wolfie. 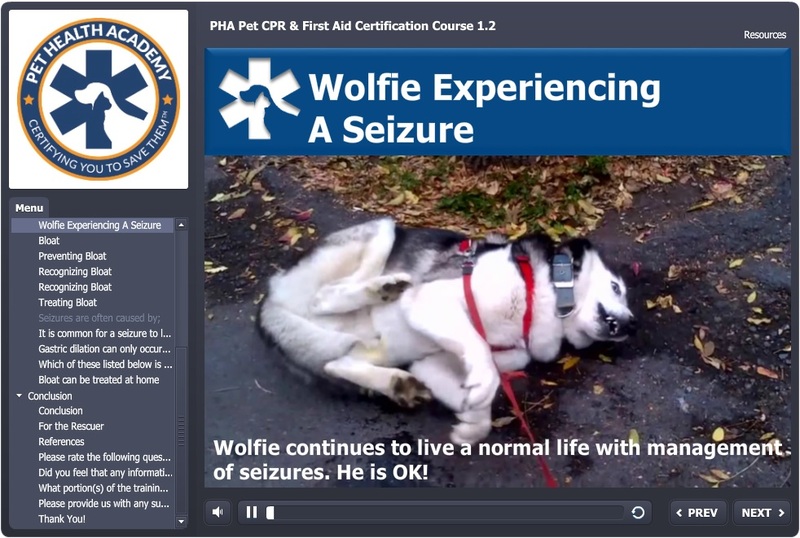 Wolfie's family gave us permission to share his video in an effort to help other animals who have seizures. It's not easy to watch, but very important to understand what seizures are, the different kinds, and how to handle an animal during and after they've had a seizure. 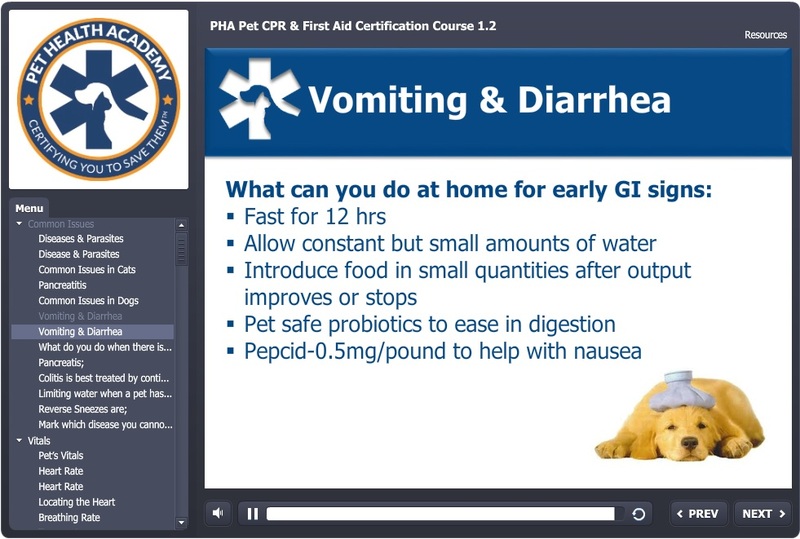 Also in this section, you'll learn about bloat, or gastric dilation volvulus. Bloat is deadly, and will require a trip to the emergency veterinarian, so recognizing the symptoms quickly is the best way to help. We'll teach you how to recognize both seizures and bloat.